One Macon restaurant celebrated a big anniversary over the weekend. Nu-Way's been “grillin' the special flavor” for the past 100 years. Bright red hot dogs on the grill await their toppings before they go into the hands of hungry customers at Nu-Way Weiners on Zebulon Road. Charles Wolf has been eating them since he was a kid. “Let’s see…I probably ate my first nu-way downtown when I was 5 or 6 years old and I'm now 81,” said Wolf. But the best part? The chili. “It’s just spicy enough. Now sometimes when I eat out here, it gets a little spicy. It makes my head sweat and I really feel like I’ve got my money’s worth,” said Wolf. 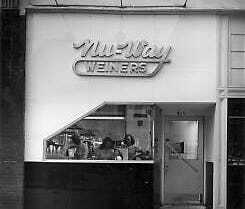 Not much has changed at Nu-Way over the past 100 years; not even the recipe for their signature chili that goes on their hot dogs. Jim Cacavias, the co-owner of Nu-Way, says the key to their century of success has been their hot dog. “We just keep trying to improve it…but you know we let the product speak for itself,” said Cacavias. Cacavias also says they are ready to rebuild their Cotton Avenue location as soon as their neighbors settle their insurance claims. The newest location at Mercer Village is scheduled to open within the two months.